Jane Parnell is a contributor to Writers on the Range, the opinion service of High Country News. She is the author of the mountaineering memoir, “Off Trail: Finding My Way Home in the Colorado Rockies,” recently published by University of Oklahoma Press. During the summer of 2002, my parents and I escaped the smoky air of Estes Park, Colorado, by spending much of our vacation in front of the TV. It had been the worst fire season in Colorado history — a harbinger of even worse seasons to come. This summer, I’ve steeled myself for a repeat not only of 2002, but also of 2012 and 2013, when Colorado Springs was threatened with annihilation. By the end of the ski season this year, the snowpack in the northern Colorado Rockies, where I live, barely exceeded two-thirds of the historical average. The Lake Christine Fire near Basalt, Colorado, burned more than 6,000 acres in July. Friends in Durango and other southern Colorado mountain towns were especially worried. Their snowpack lagged behind ours by a third. An early spring melted the snow quickly, exposing already vulnerable forests to a battering of sunlight and wind. In April, Gov. 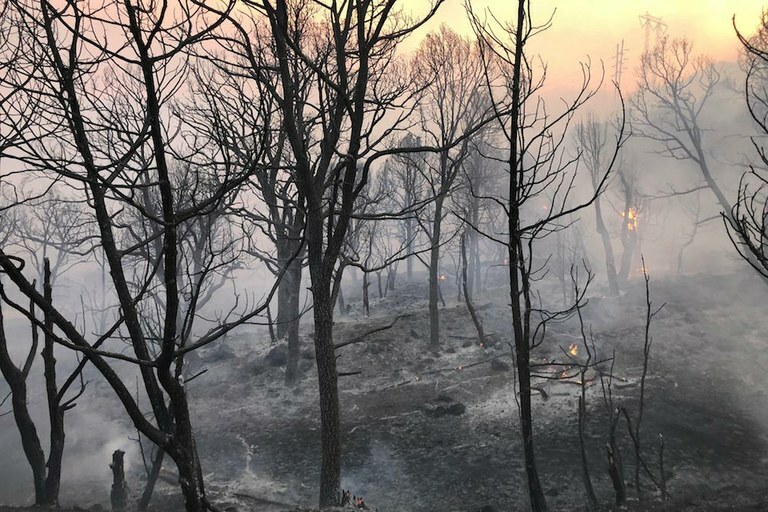 John Hickenlooper, D, like other public officials throughout the West, warned citizens to prepare for the possibility of another record-breaking wildfire season. By early June, Durango was enveloped in smoke from the 416 Fire in the San Juan National Forest. At one point, 1,000 people had to evacuate, and the national forest, the second-biggest one in the state, was closed. Tourism tanked. The 2002 Hayman Fire started in the Tarryall Mountains, miles from Rocky Mountain National Park. When my elderly parents and I braved the unpredictable elements to meet in Estes, gateway to the park, we had to don facemasks whenever we left the condo. The fires that summer burned so hot, pyrocumulus clouds formed, racing toward Denver at 50 mph. Residents and visitors were assaulted by the equivalent of two-to-five years’ worth of industrial emissions. Clouds 20,000 feet high drifted into Wyoming and Nebraska. Stuck in the condo for much of our stay, my parents and I were humbled by the courage of the firefighters we watched on TV. Shoveling and hosing to beat back flames advancing on private property, they were risking their lives after decades of misguided public policy that had equated all wildfires with Armageddon rather than a rejuvenating force of nature. For eons, lightning-sparked fires thinned the forests, creating the conditions for seedlings to take root. With fewer fires to regulate their density and health, trees have multiplied, packed in so tightly that they extinguish sunlight. All the ills of overpopulation — from disease and insect infestations to overgrown underbrush — have accumulated. Choked forests manufacture the fuel for a tossed cigarette, lightning strike or muffler spark to ignite; the warmer temperatures and extreme droughts and winds of climate change fan the flames, lengthening the fire season and stretching the resources needed to combat it to the breaking point. This year, I hope I don’t have to see elk herds straggling down the highway single file, tangled mats of hair dangling from their skeletal bodies, as I did in Estes Park that catastrophic summer. With no food up high, the survivors had to scavenge wherever they could, in lawns and gardens already denuded by their more fortunate predecessors. The midsummer monsoon will have to come soon for the outlook to improve for 2018, especially in the southern Colorado Rockies, where fires already blaze. But even if we have a wet summer, we will be seeing more frequent and more extreme wildfires in the future as a result of climate change. Meanwhile, I’ve been printing fliers to post on campers’ windshields. A mile and a half up a nearby Forest Service road, visitors park their vehicles in every turnout, sometimes for weeks, ignoring the flashing signs in town and on the highway that inform them of the fire ban. When conditions escalate to highly alarming, as they already have in many places this summer, these bans extend to charcoal grilling and the use of power tools outside. My fliers communicate the basic rules and the consequences for breaking them. Vacationers who fail to extinguish their campfires on public land can face as much as $750 in fines and up to six months in jail. Public land managers throughout the West are also trying to educate the public about the dangers of target shooting in dry conditions. The number of wildfires started by this increasingly popular outdoor activity has skyrocketed in recent years. The two shooters who started the Lake Christine Fire near Basalt, Colorado, on July 3 face felony charges. Three homes burned. Hundreds more were endangered the first week of the fire. All it takes, as the 416 Fire has already demonstrated, is one spark in parched grass.